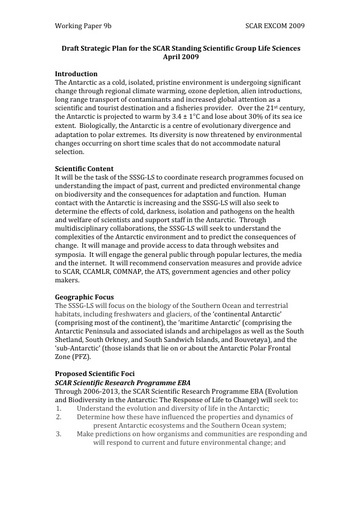 The Antarctic as a cold, isolated, pristine environment is undergoing significant change through regional climate warming, ozone depletion, alien introductions, long range transport of contaminants and increased global attention as a scientific and tourist destination and a fisheries provider. Over the 21st century, the Antarctic is projected to warm by 3.4 ± 1°C and lose about 30% of its sea ice extent. Biologically, the Antarctic is a centre of evolutionary divergence and adaptation to polar extremes. Its diversity is now threatened by environmental changes occurring on short time scales that do not accommodate natural selection.